Ocean Pools WA | Isn't it time WA had some Ocean Pools? The Town of Cottesloe is calling for submissions from the public for the review of its Beach Policy. Submissions close at 4pm on Monday the 28th of July. (Note – This does not need to be a lengthy detailed document. A very brief email is fine. But make sure you include your name and address). Also see the related post on Ocean Pools for Perth on Facebook. 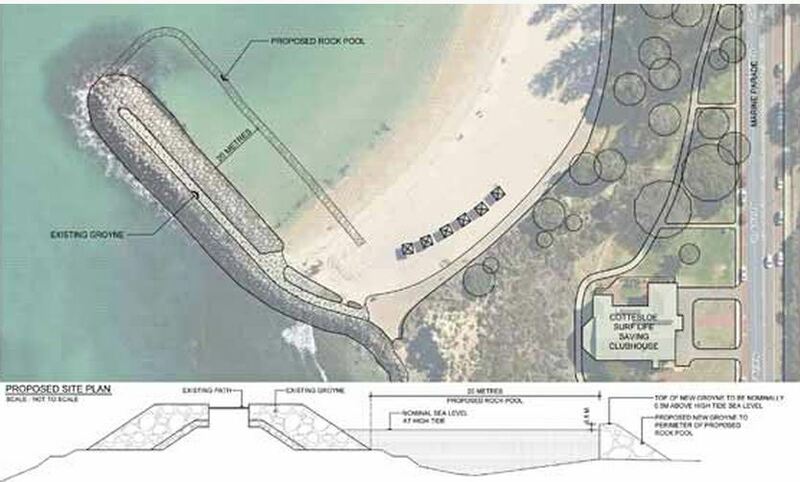 Here are the fantastic new images of the proposed Ocean Pool for Cottesloe have been released this week. The state of Western Australia is crying out for its first ocean pool and all the town of Cottesloe needs to do is reach out to the world’s best practice consultancy at its fingertips and it can happen. 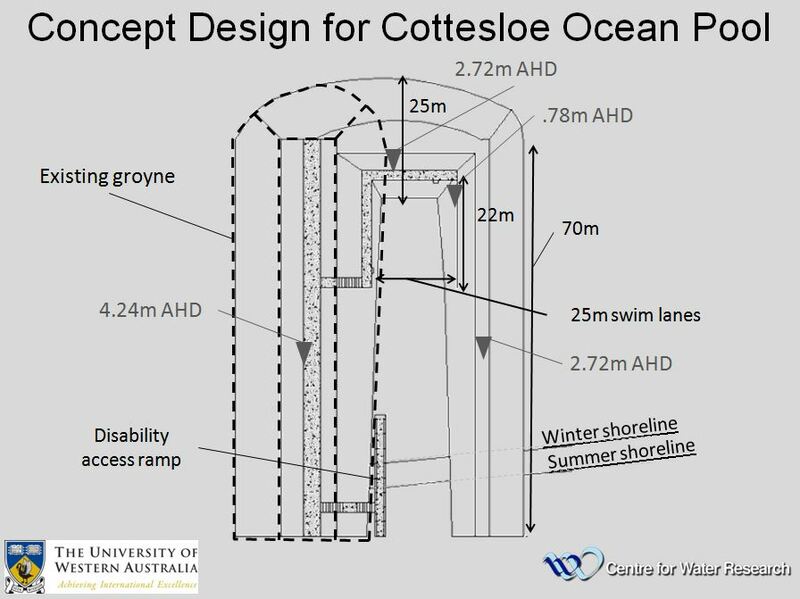 The Town of Cottesloe will soon be presented with a cutting edge design for the first ocean pool at a metropolitan beach in Western Australia. 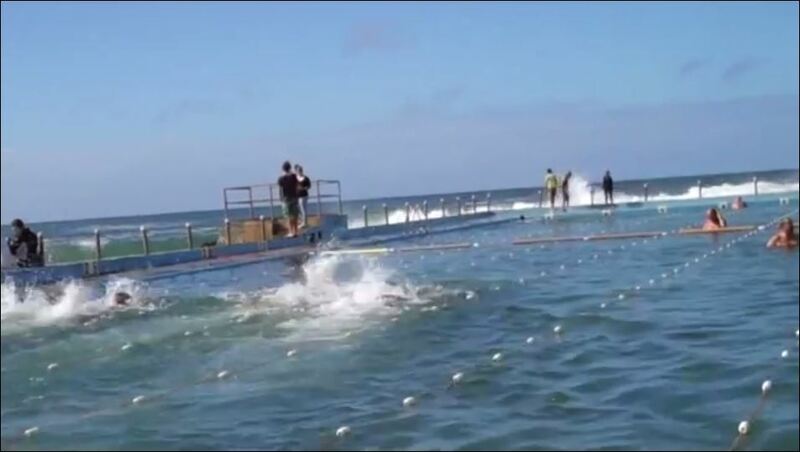 Impetus for the pool began after the second shark attack around Cottesloe that took the life of regular swimmer Ken Crewe. The shark factor is evidenced in the dwindling number of early morning swimmers and reinforced by the seemingly ever present great white sharks, like the one sighted recently cruising within metres of the shoreline at a beach not far from Cottesloe. Other factors include the ballooning of an aging population and the complete absence of a facility that allows disabled swimmers to enjoy the mainstream beach culture, which is every Australian’s right. Families with infants and small children, more mature learners, recreational swimmers and aquatic sport users are also important segments of the populations that an ocean pool caters for. Ocean pool culture is well established on the east coast of Australia. As well as providing a safe recreational swimming facility, there are dozens of swimming clubs that use them. Athletes like Olympic gold medal winner Shane Gould learnt to swim in one. She is a strong advocate of learning in a natural environment, where moving from the protection of a beach pool to the open ocean is easy to achieve. A recent survey of American tourists rated “pools in the ocean” as the number two reason they are attracted to Australia and to Sydney in particular. 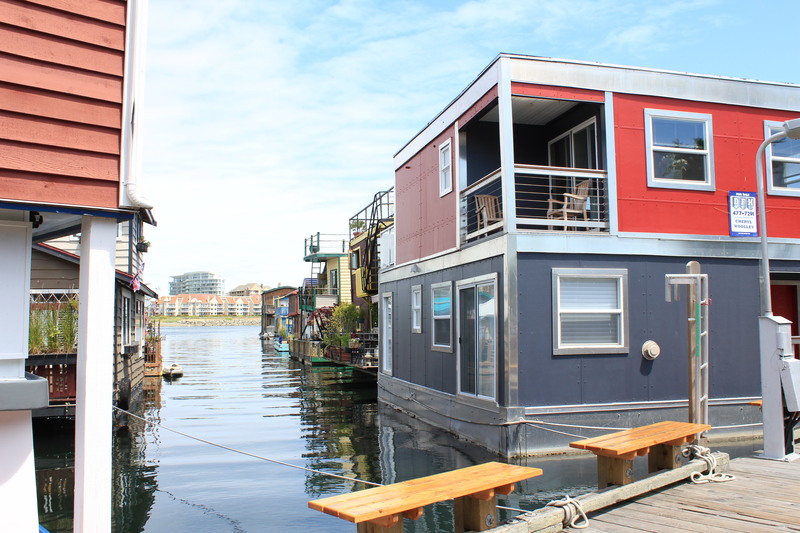 Many people in WA now have a growing awareness of the benefits of these amenities that number over 100 on the other side of the country. The cutting edge research and development work that has been done for this pool is led by Professor Jorg Imberger, Director of UWA’s Centre For Water Research (CWR) and WA’s 2008 Scientist Of The Year. 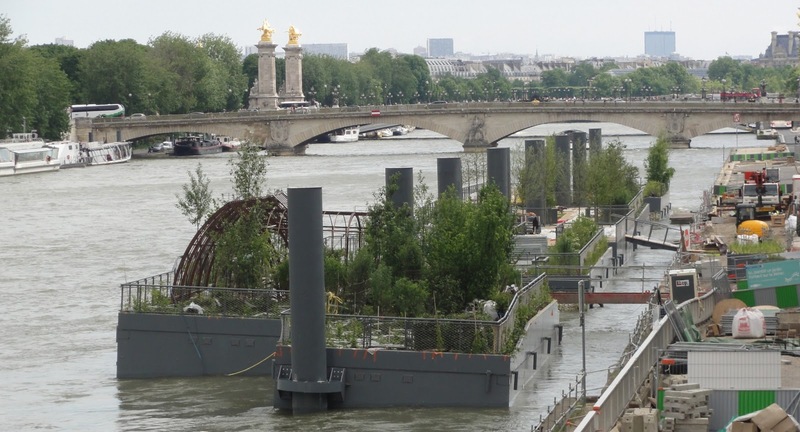 CWR’s World renowned oceanographic modelling systems have attracted international acclaim for Professor Imberger, with awards that include the Stockholm Prize For Water. As a leader in his field he currently sits on a panel of experts selected worldwide to consult on the BP Gulf of Mexico oil spill. The CWR at UWA, under Imberger’s directorship, is world’s best practice and has undertaken important research at numerous iconic locations, including the Venice Lagoon and The Sea of Galilee. There is no better environmental engineering advice available to the Cottesloe Pool than at The University of Western Australia. In support of the engineering work already done, UWA’s Professor Emeritus John Bloomfield AM, has joined the project to consult and advise on the sporting, recreational and disabled access aspects of this pool. Professor Bloomfield is also recognised as a world leader in his field with his important Australian Government Report that led to the development of the Australian Sports System, and in turn the establishment of the Australian Institute of Sport (AIS), which turned around the fortunes of sport in Australia after the Montreal Olympics. He has chaired the AIS, the Australian Sports Commission, the Australian Sports Medicine and the Australian Sports Science Federations. His contribution to Australia saw him inducted into the Australian Sporting Hall of Fame in 2007. Morrison, a Cottesloe citizen Of The Year, passed away in 2006 but he is recognised as the Godfather of the Cottesloe Ocean Pool. He held local life saver Tom Locke, also a Cottesloe Citizen of the Year, responsible for its completion as his life was drawing to a close. 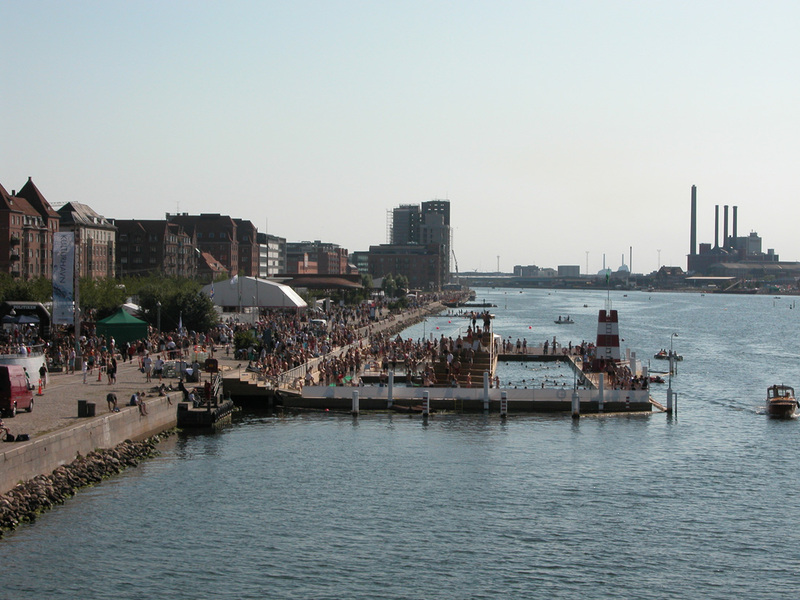 History and evidence demonstrate that where ocean pools are already built they are much loved by the users but most of these structures date back to the 1930s. Austinmer’s pool just north of Wollongong is an example of this. Many aging pools in other states in need of refurbishment may benefit from the very low maintenance design delivered by Professor Imberger’s CWR. 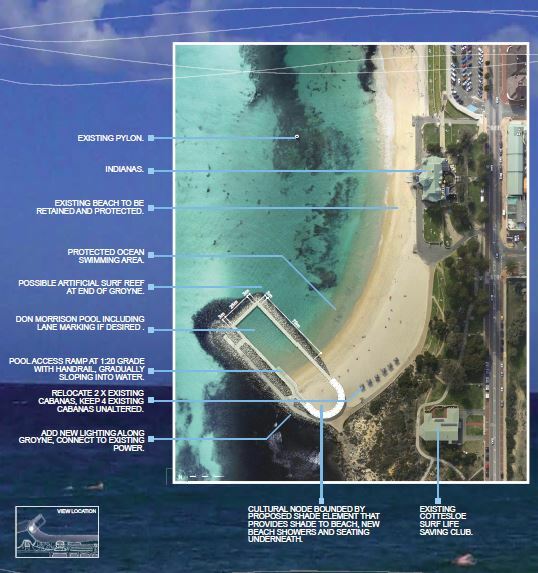 On the first of May the Town of Cottesloe will conduct a public briefing on the proposed pool. With ocean pool support groups in other areas of Perth and regional WA, this state is crying out for its first one. Albany, Quinns Rock, Stirling, Fremantle and the Shire of Irwin are all looking to the world class preparatory work already completed at Cottesloe. The Cottesloe pool’s 21st century engineering science will eliminate much of the costly cleaning of old pool designs that accumulated sand, weed and other debris. Western Australia is more than ready for this state-of-the-art ocean pool at Cottesloe. Once it is established, others will follow. 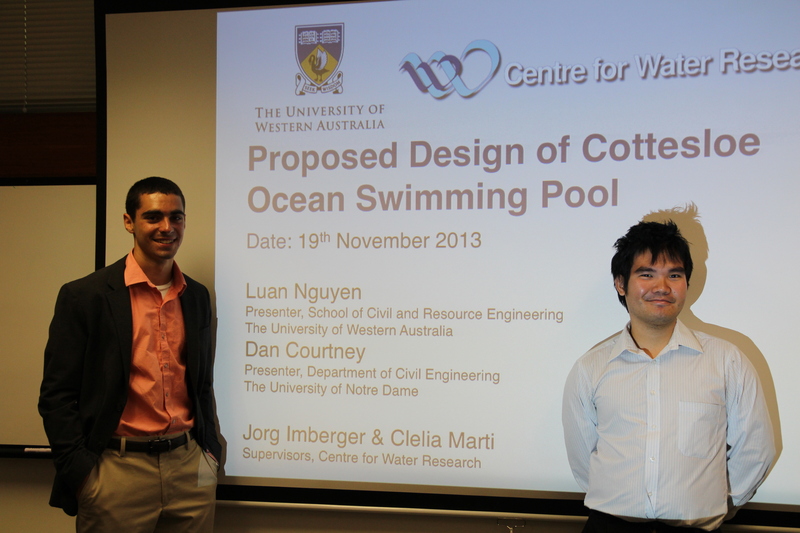 Brilliant presentation yesterday by Luan Nguyen and Dan Courtney at the Centre for Water Reseach at UWA about their research on the Cottesloe Ocean Pool. 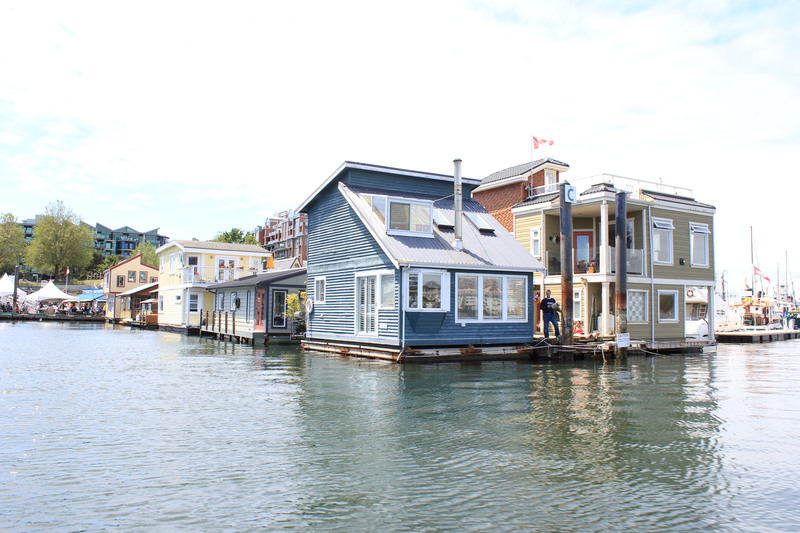 They have come up with a design that is self-flushing and virtually maintenance free. 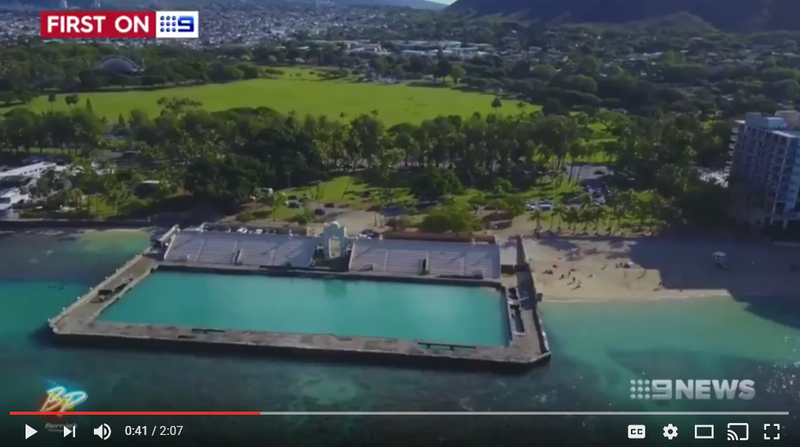 The good news is that it will not effect the beach and will improve surfing conditions and it would only cost about $1.65 million. 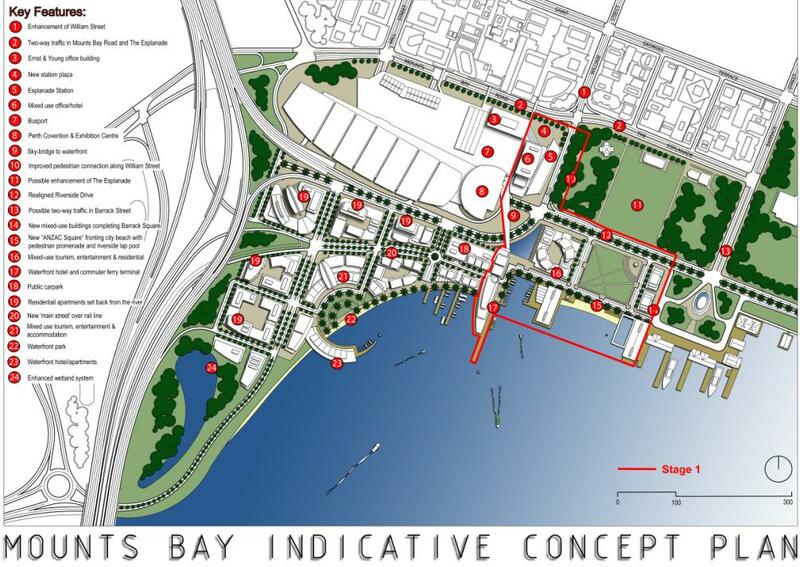 The exciting new news is that it looks like it can even be heated using wave power for the additional cost of around $2m, which could also create enough electricity for the surrounding beach front. 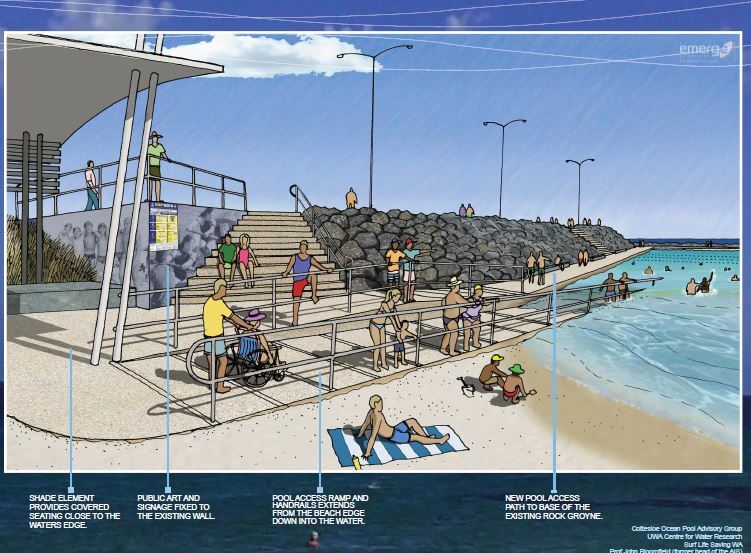 The design includes access for the disabled, so people in wheel chairs will fianally go to the beach and swim and enjoy the ocean environment. The pool’s size needs to be determined, but it would have lap lanes and would be used just like a normal pool for squads, swimming lessons, water polo and recreational swimming with a deep end and a shallow end.